How to watch Pirates of the Caribbean: At World's End (2007) on Netflix USA! Sorry, Pirates of the Caribbean: At World's End is not available on American Netflix, but you can unlock it right now in the USA and start watching! With a few simple steps you can change your Netflix region to a country like Hong Kong and start watching Hong Kongese Netflix, which includes Pirates of the Caribbean: At World's End. We'll keep checking Netflix USA for Pirates of the Caribbean: At World's End, and this page will be updated with any changes. 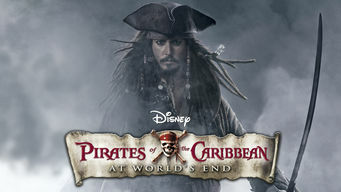 Pirates of the Caribbean: At World's End is not available in USA BUT it can be unlocked and viewed! In the third installment of the swashbuckling series, Capt. Barbossa, Will and Elizabeth set sail for Davy Jones's locker to rescue Jack Sparrow. The living -- and the living dead -- battle for power on the high seas. The key to victory lies in one man's heart. There is a way to watch Pirates of the Caribbean: At World's End in the USA, even though it isn't currently available on Netflix locally. What you need is a system that lets you change your Netflix country. With a few simple steps you can be watching Pirates of the Caribbean: At World's End and thousands of other titles! Watch "Pirates of the Caribbean: At World's End"